St. Martin's Press, 9781250069207, 400pp. The Lowells of Massachusetts were a remarkable family. They were settlers in the New World in the 1600s, revolutionaries creating a new nation in the 1700s, merchants and manufacturers building prosperity in the 1800s, and scientists and artists flourishing in the 1900s. For the first time, Nina Sankovitch tells the story of this fascinating and powerful dynasty in The Lowells of Massachusetts. Though not without scoundrels and certainly no strangers to controversy, the family boasted some of the most astonishing individuals in America’s history: Percival Lowle, the patriarch who arrived in America in the seventeenth to plant the roots of the family tree; Reverend John Lowell, the preacher; Judge John Lowell, a member of the Continental Congress; Francis Cabot Lowell, manufacturer and, some say, founder of the Industrial Revolution in the US; James Russell Lowell, American Romantic poet; Lawrence Lowell, one of Harvard’s longest-serving and most controversial presidents; and Amy Lowell, the twentieth century poet who lived openly in a Boston Marriage with the actress Ada Dwyer Russell. 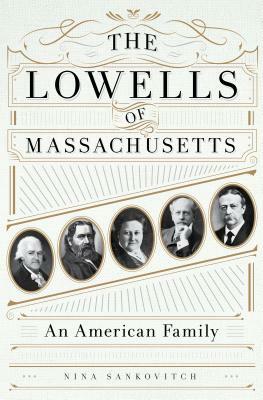 The Lowells realized the promise of America as the land of opportunity by uniting Puritan values of hard work, community service, and individual responsibility with a deep-seated optimism that became a well-known family trait. Long before the Kennedys put their stamp on Massachusetts, the Lowells claimed the bedrock. NINA SANKOVITCH is the author of Tolstoy and the Purple Chair and Signed, Sealed, Delivered: Celebrating the Joys of Letter Writing.